X-PROJECT has released a new single entitled Scammer Watch, which is presently enjoying reviews on radio stations nationwide. The new job, which features Dude of Krazy Kulture and Ajelinca is aimed at celebrating love, the group says. "Love is the key to every successful thing in life. That is one of the reasons X-Project takes it very important. "The new single is titled Scammer Watch. It is about a guy whom a lady is tempting on the dance floor. We believe she is a scammer. She has stolen the heart of everybody on the dance floor", they added. 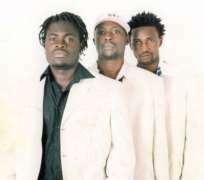 X-Project last year dropped their second album, Sierra Naija, which contains hit tracks like Lori le, Mo Mabalo, Pump The Rhythm and Tender Love. Aside Lori le which is making waves in Nigeria, the Nigerian Music Award winner and the KORA awards nominees also have Kam Nia Mi, another hit song that is making waves in Sierra Leone at the moment, in the album. Scammer Watch was co-produced by Majeed Akinwoye, the only Nigerian in the group, the award wining music producer, Puffy T and Sam Kargo .